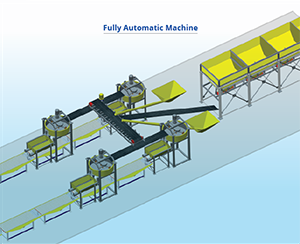 Providing machines for paver/tile production with multi-tasking specifications. It is capable of performing a large variety of tasks in the field of paver production with high performance. We suggest different levels of paver plants with a production capacity of 3500-4000 moulds / 8 hour shift. Technically specified as an 8mm plate with 3000 drill holes approximately. Having two 1.5 HP 3 phase Motor and a top plate thickness of 8mm. Contained with 3 working table and have a machine dimension of 10 Ft length * 2.75 width * 2.96 Ft height. Machine have a length of 26 Ft and the tiles have a size of 2 Ft* 2Ft with height 100mm. Automatic movement of rubber moulds with a production capacity of 3000 Sq. Ft/ 8 hour shift for Tiles and 2000 Sq. Ft/ 8 hour shift for Interlock paving blocks. It can contain volume a volume of 200 liters and with a balancing capacity 150 kg/ Batch. Working with a power of 3 HP electric motor and having a bottom plate as 10mm and side plate 8mm. It has a dimension of 32” dia*depth 16” and a Reduction gear box system with a proportionate ratio of 40:1,NO:3 with a bearing of SKF. 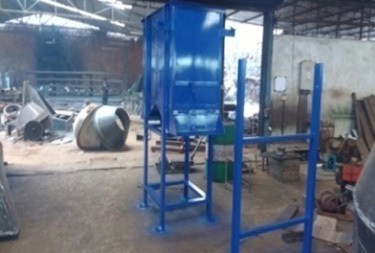 This particular one is used for concrete mixing process with a working capacity of 500 kg and a volume of 700 liters. The feeder Hooper must have a capacity up to 400 liters. It is featured with power 7.5 Hp,weight 750kg and a dimension of 55” Dia, 16” depth. The Muller rotation of the hooper is 16 rpm and with a plate thickness of 12mm, 10mm for bottom, side plates respectively. It has an open type Gear box system at the bottom position with a SKF bearing. 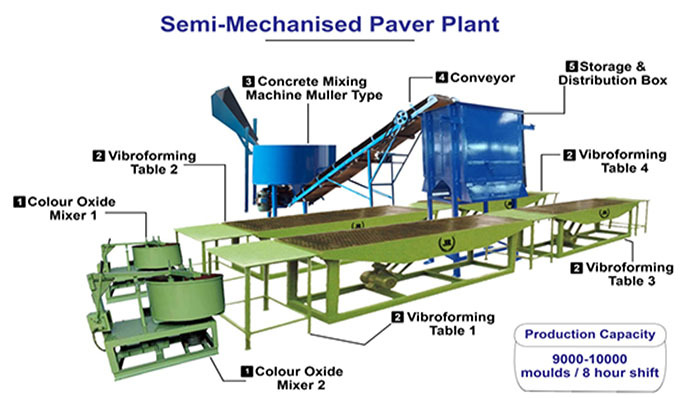 Provide machines for paver/tile production. This particular machine can handle multiple tasks at a time and results with high performance. 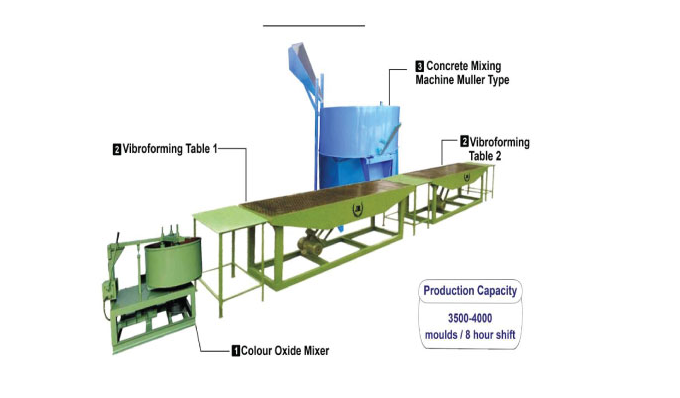 We suggest different level paver plants with a production capacity of 9000-10000 moulds/8 hour shift. Having two 1.5 HP 3 phase Motor and a top plate thickness of 8mm. 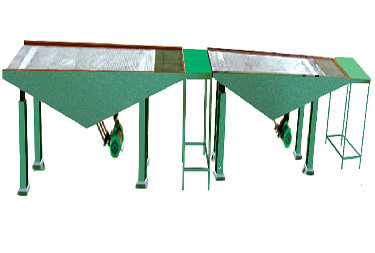 Contained with 3 working table and have a machine dimension of 10 Ft length * 2.75 width * 2.96 Ft height. Machine have a length of 26 Ft and the tiles have a size of 2 Ft* 2Ft with height 100mm. 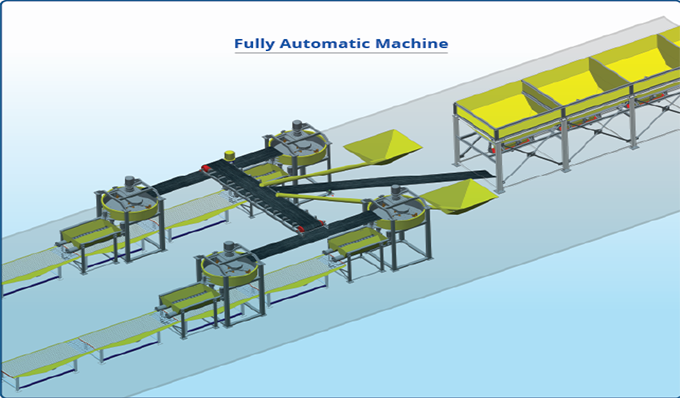 Automatic movement of rubber moulds with a production capacity of 3000 Sq. Ft/ 8 hour shift for Tiles and 2000 Sq. Ft/ 8 hour shift for Interlock paving blocks. It can contain volume of 200 liters and with a balancing capacity of 150 kg/ Batch. It works with a power of 3 HP electric motor and having a bottom plate as 10mm and aide plate 8mm. It is featured with power 7.5 Hp, weight 750 kg and a dimension of 55” dia, 16” depth. The Muller rotation of the hooper is 16 rpm and with a plate thickness of 12mm, 10mm for bottom, side plates respectively. It has a open type Gear box system at the bottom position with a SKF bearing. 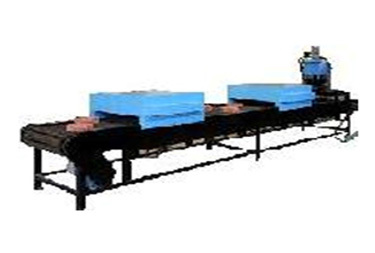 The Conveyor belt is a Nylon 20ft with 3hp motor and also offer its concerned accessories along with it. Ease of material loading to mixer. 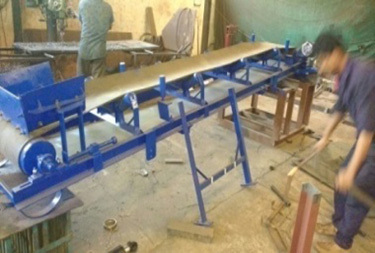 Normally it is done manually which require large manpower. Also there is no precision in quantity, when taken manually. 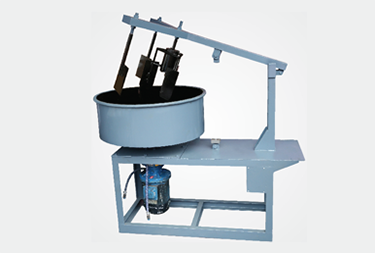 Since every batch is same in weight, as designed, the quality of product is consistence. A lot of time is saved to take each batch, which will increase the production. 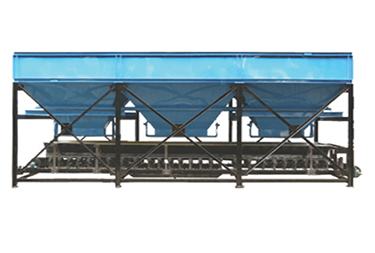 It is also supported by cement screw conveyor with batching arrangement. 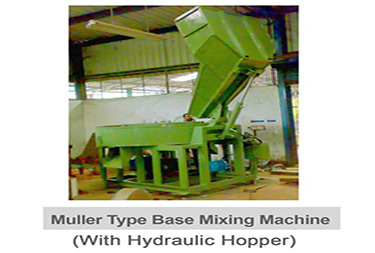 Cement is stored in bottom hopper and it is used as per requirement in batches. It will control the exact dosing of cement. Which is the most costly item, As well as it governs the quality of product. Silo can also be installed to save on loading cost. These are designed to mix concrete very well at minimum water cement ratio. 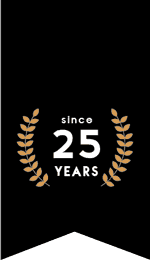 It has sturdy long lasting construction. It is supported with digital water meter. So that exact quantity of water is supplied to the concrete batch. Mixing arms are made of alloy steel. Those can be replaced easily. Hard cast lining is provided all around and at bottom. Those are very much power efficient. Higher the water cement ratio, higher the workability, lower the strength is the basic of concrete. It is but natural by all workers to use more water in concrete for ease of working. We have resolved this problem with proper and easy concrete feeding machine. We can maintain the best suitable water cement ratio. The output is many times more than the manual filling. It has setting to take exact quantity of concrete as well as filling speed; filling quantity is settable as per requirements. Even ladies workers will give the same output as gents, since the working fatic is almost nil. Esigned this for through mixing of First layer. 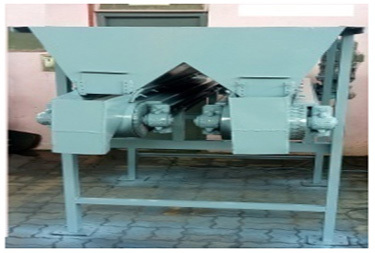 Planetary type gear box is provided for the excellent concrete mix with less water cement ratio. Since the mixer drum is not rotating we can fix auto dosing concrete conveyor to this mixer. This will increase the productivity as well as Quality of work. Easy to wash and clean for fast color change. 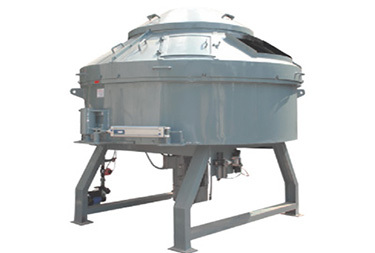 Mixer is provided with auto weighing and digital water dosing system. This will insure the quality consistency of the final product. These are technically balanced for optimum even vibration all over. 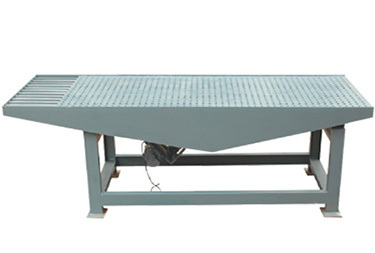 The speed of mould passing on table is also adjusted to its full capacity. 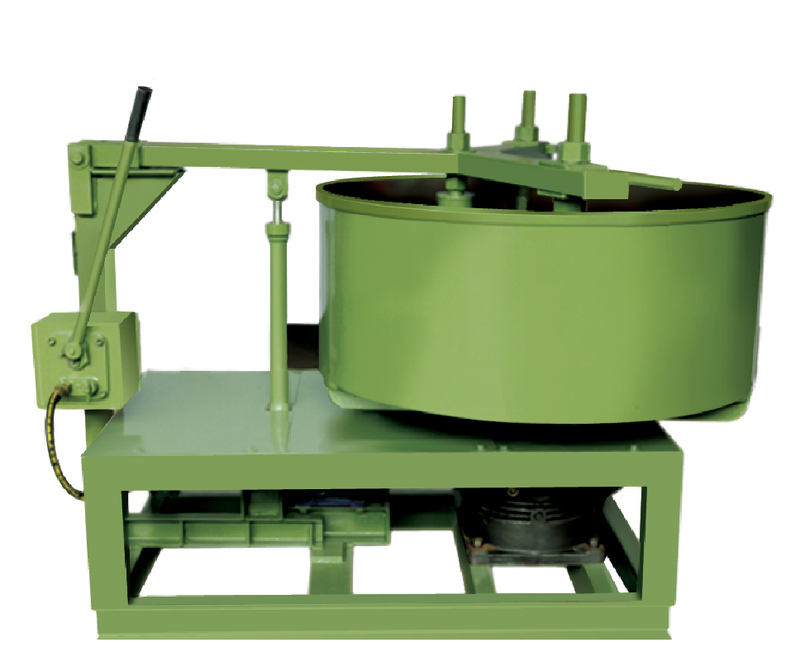 Paver Block Demoulders ( Demolders ) is the well designed compact equipment to remove concrete paver from rubber molds. It is the most laborious and critical operation in paver production. We have made it very easy. A lot of saving in space, since you need not spread the pavers on ground for lacquering. Double operation of collecting the pavers is avoided. De molding manually is very difficult and laborious operation. All the labor fatic is removed, which will give a good production. It is very effective particularly in winter season.